If you're looking to expand your arsenal of lenses on the cheap, yet still expect high quality glass - these Nikon lenses may be perfect for you. Purchasing a new lens is no easy task for the cost-conscience individual. Adding new Nikon glass to your Full Frame FX kit can be stressful, especially after pouring hours of research into the best and cheapest lenses and still being overwhelmed with too many options. This guide lists 4 high-performing, professional Nikon full frame (FX) lenses that are inexpensive and wont break the bank! They also cover the widest focal range for any situation. First we must understand Nikon Corporation's introduction of their F-Mount. While Nikon in-camera color rendering may not provide the same instant-gratification that Canon Camera color profiles offer, Nikon optics, when focused correctly, have been tack sharp for 100 years, their optics have been reported as industry leaders. This lead time of development and optic manufacturing opens up nearly a century of possible lenses. Sound too good to be true? - Keep reading. A huge benefit that Nikon has over every Camera company is that Nikon Corp has been producing lenses and cameras since 1917. Formerly known as the Japan Optical Industries Corporation until 1946, Nikon launched the Nikon F SLR in 1959. While this camera went through a few different variations (the 1965 version pictured above), Nippon Kogaku (Nikon Corp) developed the bayonet F-Mount with the launch of the Nikon F SLR in 1959. That's right, Nikon has produced lenses with the F-Mount since 1959. They have used the same mount on their SLRs for 6 decades– 60 years! This unlocks so many opportunities to buy vintage glass, many of which will still Auto-Focus under the right conditions. This guide focuses on 1 of those lenses, but it's fundamentally important to understand that all Nikon DSLRs and Nikon Film SLRs since 1959 have used the same lens F-mount, so between DX and FX, Film and Digital, Vintage or New, most models/lenses are cross compatible. Furthermore, any of these lenses will work on any Nikon DX Crop Frame camera (D500, D7500, D5600, D3500, as well as older models) or Nikon FX Full Frame camera (D5, D850, D810, D750, D610, as well as older models). I highly recommend the following lenses since they are high performing and inexpensive. I have carried around my Nikon D750 with this arsenal of lenses for the past 3 years and my best images were taken using them. Below, you'll find vintage everyday lens, 1 telephoto lens, 1 portrait lens, and 1 wide angle lens. Three of them are FX full frame lenses, and one of them, while technically a DX lens is functionally an FX lens when used in Full Frame mode within the adjusted focal range (compensating for crop-factor of 1.5x). 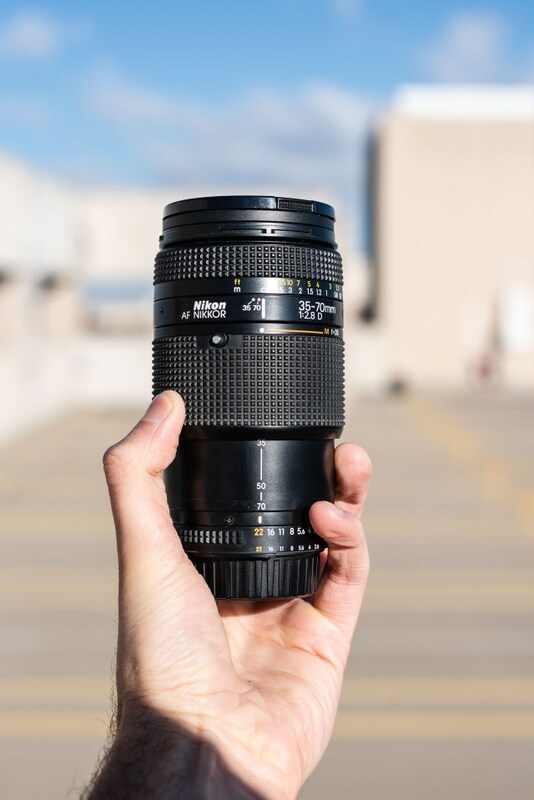 If you're looking for a bargain solution to serve your needs for taking portraits, landscapes, urban, street, or cityscape photography you should consider checking out these 4 lenses. When used on a Full Frame FX Nikon, they cover a focal range of 18mm - 24mm & 35mm - 300mm. If you buy all 4 lenses as suggested, you will only pay approximately $1,000 - $1,100 for everything. (Prices fluctuate based on demand and inventory of sellers / resellers). Since we recommend that you buy used gear, we encourage you to read out Guide to Buying Used Gear article. This is the best lens for everyday photography for those looking to save money on a Full Frame setup. Sitting at the most versatile focal range between 35mm and 70mm at f/2.8, this lens will sure to be your go-to lens for most situations. The 35-70mm f/2.8D lens was originally designed in the 1980's for Nikon's film SLRs. It has a superior build-quality over many of its more expensive counterparts considering it's manufactured in Japan, has full metal & glass construction, and has a vintage purple and green coating on the glass which adds an artistic effect to lens flares at night. Be aware that this lens will only auto-focus on a camera that has an external focus-motor. Since it's an old lens, it does not have a focus motor built into it. Pro Tip - Due to the Purple and Green coating on the glass, when used at night you'll see an artistic lens flare effect (seen in image below). While this lens may not be the fastest telephoto, it's certainly the most bang for your buck, especially when purchased used. 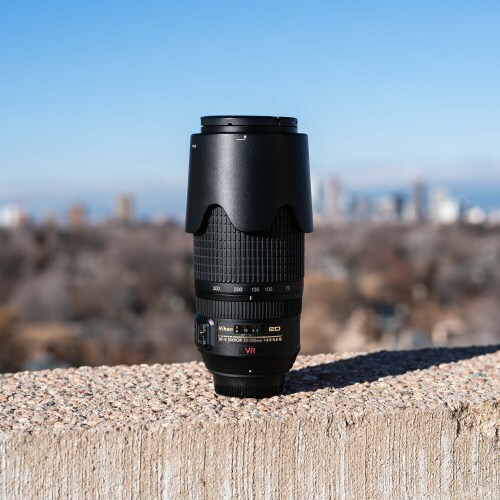 Granting an expansive focal range and far reaching zoom paired with the built in Vibration Reduction VR, this lens is capable of creating a lot of different kinds of images. Anything from Landscapes to candid street portraits, to shooting this Solar Eclipse Composite. If you're afraid of a hefty price tag but want a great zoom lens, look no further. Pro Tip - When using this lens, keep the VR switch turned 'On' to reduce vibration for sharper images. The esteemed 'Nifty Fifty' is an essential for any photographer. Scientifically, when shooting with a 35mm Full Frame camera, a 43mm focal length would reproduce visuals at exactly the same angle of view as humans perceive space. The closest professionally manufactured lens is the 50mm lens. 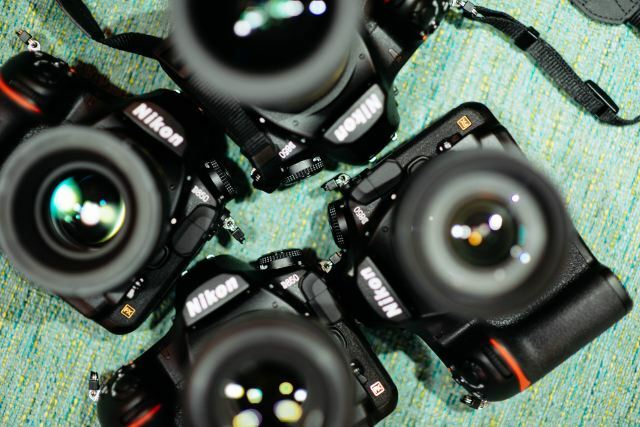 Of any lens you can buy, 50mm is closest to how humans perceive space. That, and shooting at f/1.8 works to highlight your subject and create stunning bokeh of any artifact that is in frame but not in focus. Pro Tip - Try shooting portraits with your aperture wide open at f/1.8 to achieve the bokeh effect. Hear me out! – I know this lens is a Crop Frame and not a Full Frame lens, but you can use it as an FX equivalent in Full Frame mode! Since crop frame lenses are designed to cover a smaller sensor area than full frame lenses, they are more compact, lighter, and less costly than traditional full frame FX counterparts. Also, since this range, on a Crop Frame sensor covers 12mm-24mm, the Crop Factor allows us to functionally use this lens as a Full Frame lens without pinhole or harsh vignetting between 18mm-24mm. (Since crop factor is 1.5x the minimum focal length). When this lens is zoomed out to 12mm the user will notice a harsh pinhole vignette. Users can also intentionally use the harsh pinhole to give the photos an edgier look, a great look for gritty street and protest photography! Pro Tip - Buy this lens used to save hundreds of dollars. Check out our Guide to Buying Used Gear for more insight!